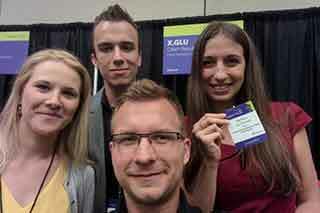 Students of the Faculty of Electrical Engineering Marek Novák, Tomas Pikous and Barbora Suchanova are developing a baby glucometer in form of a credit card within the XGLU start-up. Thanks to their solution, the students achieved worldwide victory at the prestigious Microsoft Imagine Cup in Redmond on July 27th. This brings $ 250,000 worth of prizes. More than 50 projects have advanced to the finals of the competition from national competitions. Startup X.GLU, founded in May 2016, works with smart phones. It immediately informs the parent of the child about the measured values, also informing about the child's position. In case of complications, parents can intervene immediately.